A Night of Endless Captivation | What an Amazing World! 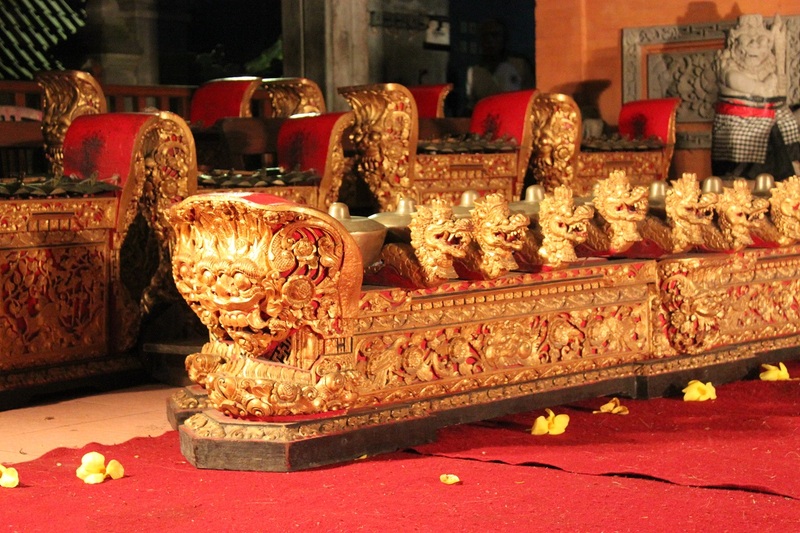 It was 7 pm, James and I were seated in Ubud’s wantilan, a shaded traditional pavilion open on three sides with a stage set up for the night’s performance, flanked by Balinese gamelan – a set of traditional musical instruments originally created to lull kings to sleep – glowing under the stage lighting. At 7:30 the lights were suddenly dimmed, leaving only the stage illuminated in golden glow, the crowd was instantly silenced in anticipation. 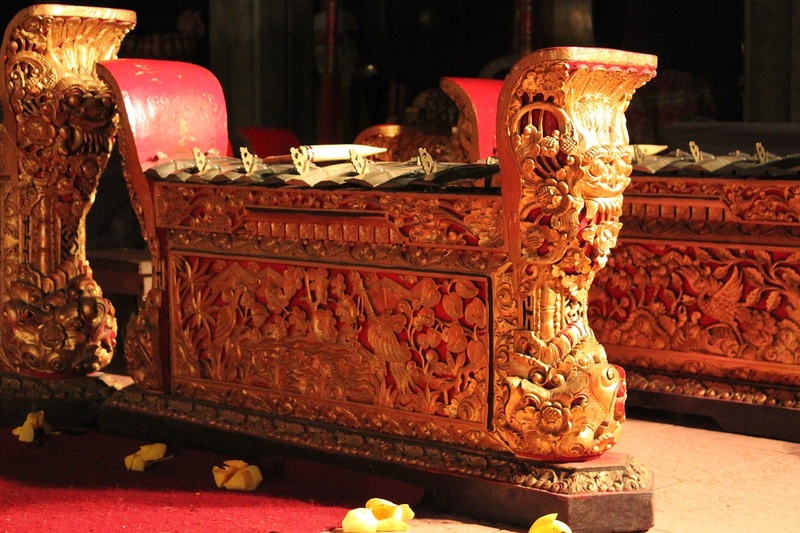 In an absolute unison gamelan players started hitting the brass plates of the musical instrument, while two kendang – Balinese tabla – players sat on both sides of the stage, at the far right end two gongs were alternately hit, enveloping the tunes of gamelan instruments in a captivating harmony. 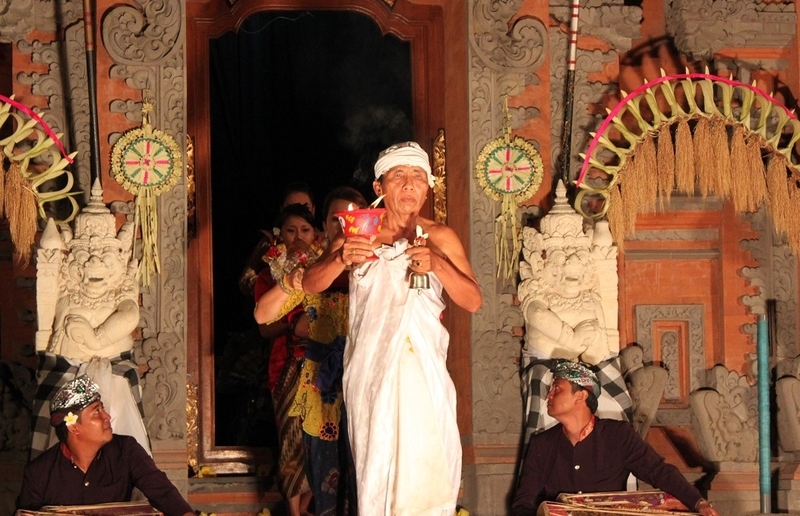 The fast-paced rhythm of Balinese gamelan was then silenced when a white-robed old priest entered the stage. A bell on one hand and a chalice filled with offerings on the other, he was preparing to bless the night’s performance, a ritual mandatory in almost all events held on the island as a gesture to seek gods’ blessings. Two girls – the main Legong dancers – helped by attendants donned the iconic flower-laden headdresses. Then, the most amazing scene unfolded before our eyes: the two dancers moved around the stage performing elaborate sets of hand and body movements with their eyes closed. They hovered back and forth and from one side to the other side of the stage completely unable to see each other, at times they moved as if they were about to collide. But they did not. For the next few minutes James and I were mesmerized by the fine gestures of the two dancers, who later opened their eyes and flared the famous Balinese dancer’s stare. As time passed by, the audience’s anticipation grew even higher for more stunning performances, as if one amazing performance was not enough. 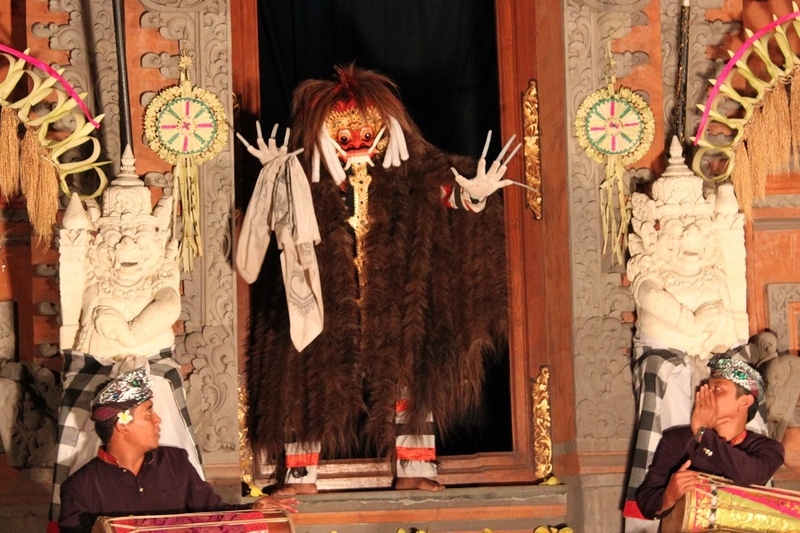 Jauk, a demon with long fingernails entered the stage afterwards, ambling around and unexpectedly waving his fingers to the front row audience. The supposedly frightening demon turned out to be the night’s clown. 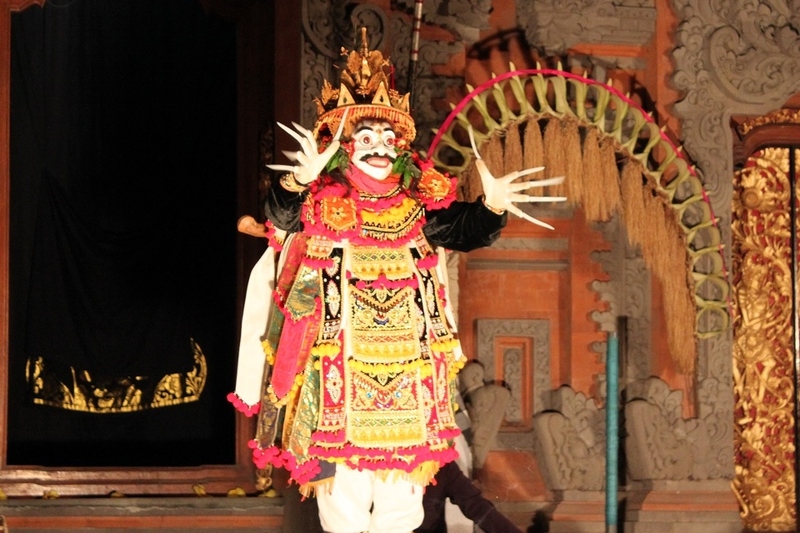 Then a troupe of men and women dancers took the stage, carrying the emblem of Ubud while performing elaborate dances with a hint of modern dance influence here and there. Then all of a sudden a male dancer stormed into the stage once the troupe left, wearing an exquisite costume with brightly-colored intricate traditional patterns all over it. The rough-looking face of the dancer at times turned soft, more like seducing the audience with his flirty eyes and smile. But as the gamelan players hit firm-pitched notes, his face turned stern once again then he jumped around, striking a menacing pose. Kebyar Trompong had James fooled throughout the entire performance as he mistakenly thought it was a woman due to the dancer’s make up and ambiguous gestures. One performance after another kept the audience glued to their seats, cheap plastic seats to be precise – no fancy seat by any means. The last performance portrayed the life of Abhimanyu, an important figure from the Hindu epic Mahabharata, the son of Arjuna and the grandson of Indra, the king of all gods. From his marriage with Siti Sunari to his battle against demon and evil spirits, the dancer’s facial expressions displayed his mixed emotions, of happiness and fear. 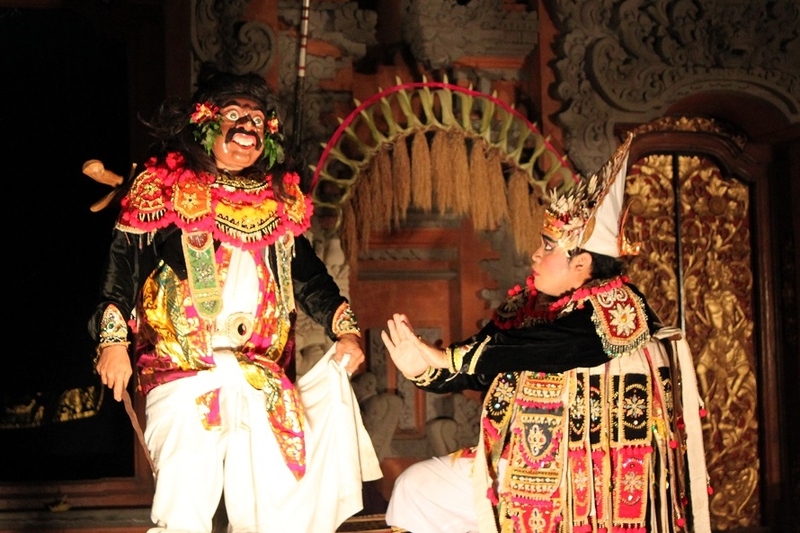 For me the one and a half hour series of performances was not like anything I had seen before, such a captivating traditional entertainment right at Bali’s cultural heart and just across the Ubud Palace. After the final performance, dozens of locals donning white robes gathered outside the wantilan, then marched away to the east of the palace down the main road while playing cèng-cèng (Balinese cymbals) and small gongs along the way. I kept saying how amazed I was on our way back to the hotel, millions of times, like a kid who just went to Disneyland for the first time. When I was writing this post I realized how often I told you how amazed I was on our way back to the hotel. 🙂 I believe you’re not alone about the confusion, but now you know how Hindu priestesses looks like after seeing them in Goa Lawah and Batubulan. This June will be my 6th or 7th time to the island in the last three years, but the more I go the more I want to discover its beauty and unique cultures. Can’t wait for that! I have often heard of the Balinese dancing. Bali is one place I’d really love to spend some time. Even I was blown away by its elaborate movements. Together with the dancers’ ornate costumes and the rich tunes of gamelan they create a spectacle everyone should watch. Such wonderful costumes! Excellent post as always. Fascinating. They look even better if you see them in person. The bright colors of the cloths and flowers and the intricate traditional patterns are definitely not to be missed when you are in Bali. Thanks Sue! Stunning post, Bama. Beautiful images and write up. Great to see the Epic Mahabharata been enacted in a different country. It shows how much we are connected culturally, right? Thank you, as always, Sreejith! Mahabharata and Ramayana played a big part in Southeast Asian history and culture. Those magnificent Hindu temples in Indonesia and Cambodia are all decorated with beautiful stone carvings often depicting scenes from both epics. Many characters well known in India are also very popular here in Indonesia, Hanoman (Hanuman) for example. Even our national airline was named after the mythical bird Garuda. We are very well connected culturally, indeed. So interesting, and nice photos. Must have been a magical night. Thanks Meredith! Have you ever watched the dance? Bali must be very different back then, also Kuta. Wow, I really enjoyed reading about the dance and the photos were fantastic! I now will have to visit Bali! It has not changed in years! 9 years later the dance is still enchanting as ever! Those costumes are spectacular! You know how I’m obsessed with color and intricate patterns… I think I would die of happiness in Bali. 🙂 Thanks for sharing this experience, I felt like I was there watching it with you. Hi Meghan! Good to have you back here. I do believe you would die of happiness, and wake up in a paradise where colorful patterns, fragrant flowers, lush forests, green paddies, intricate stone carvings and beautiful beaches are the norm. 🙂 I hope you’ll find yourself in Bali sooner than later! A fascinating series Bama. You capture the atmosphere so well. The similarity to Indian rituals and dance drama is uncanny! Thanks Madhu! When I was little I had this colorful comic book of Ramayana, and that’s how I started enjoying Indian epics. My father himself knows Mahabharata quite well. So when I watched those dances in Bali, I could connect with the stories, or most of them. And I know you would love to watch them too. I’m glad you enjoyed the photos, Shmruthi. Go straight to Ubud and delve into the rich local cultures, enjoy the color explosion and fragrant flowers and many other things that will definitely tickle your senses. 🙂 Thanks for reading! Awesome post Bama! 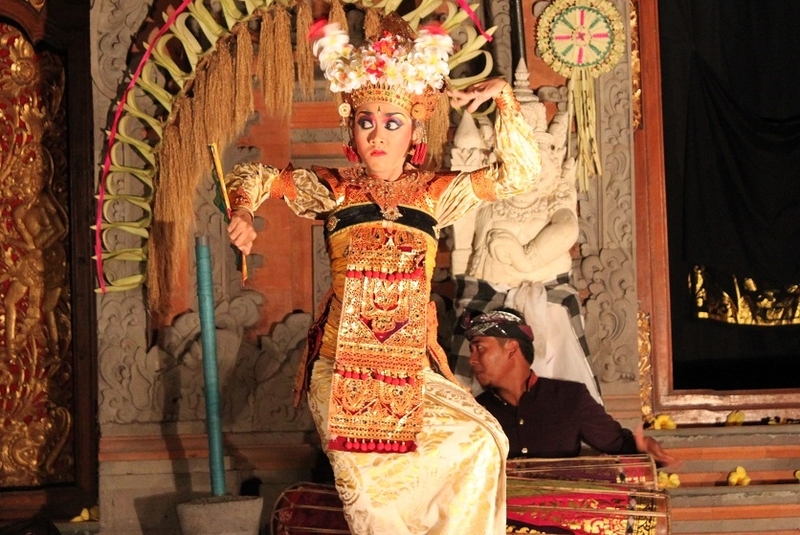 Enjoyed your writing style and the photos..Balinese dancers are simply stunning! I’ve been to Ubud, Bali. 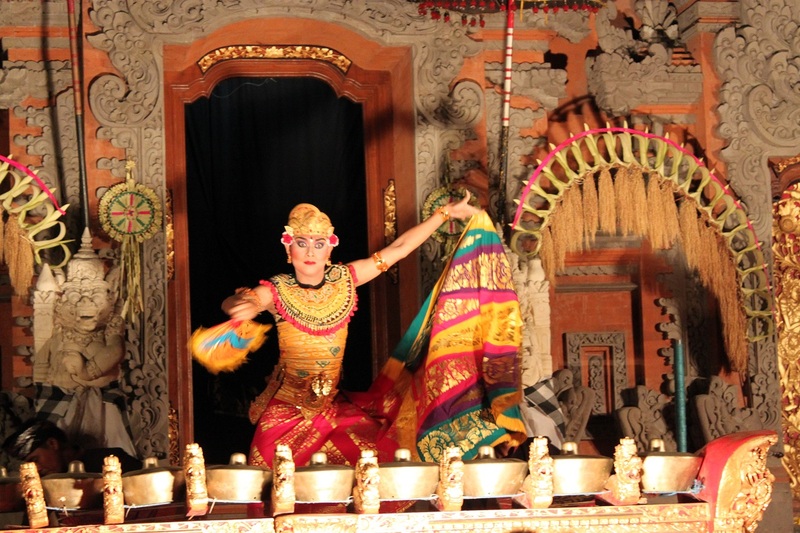 And watched the same Balinese gamelan. It’s truly remarkable show. I love how you took these beautiful photos too. Truly remarkable, indeed. Gamelan is not a new thing for me as I learned Sundanese and Javanese gamelan. But Balinese people really know how to make the traditional musical instruments more appealing to a broader audience. Thank you for your kind words, Qariana. An incredible series…there is something so riveting with live performances, especially when they contain such rich cultural scenes. Add that to your wonderful writing and you have this gem of a post. Wonderful post Bama! Thanks Randall! To see how a traditional dance performance could be so interesting and captivating was very encouraging. We all can expect Legong and other Balinese dances will be performed by enthusiastic local men and women for decades to come. One day soon, I hope to see such dances in person…looks like such a great time. Again, great writing. 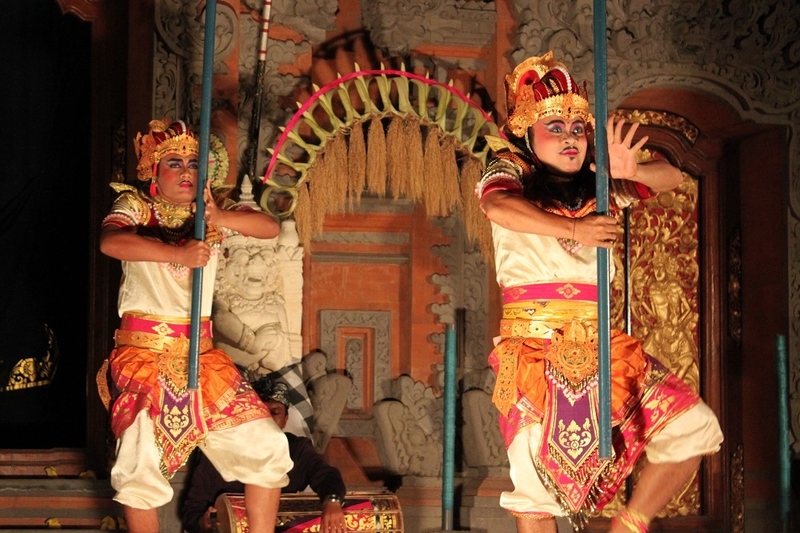 I have done some research on these dances and their meaning when I was in Bali for my Anthropology career. Have you been to village performances? They are even more impressive since people enter into a state of trance at those places. Good writing! Thanks again, Debbie. I haven’t been to village performances but I can imagine they must be even more magical and thrilling. Getting into a state of trance is actually quite common in Indonesian traditional dances. I once saw a group of dancers in trance when they performed at a mountain slope near Semarang, Central Java. I have got to see this performance when I visit Indonesia!!!!!! Hi Ariel. Nice to have you here. 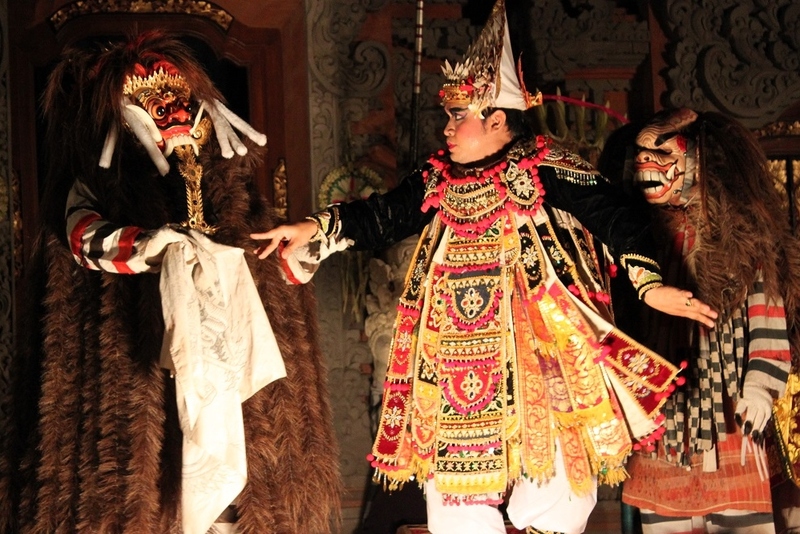 The dances in Ubud are things you should never miss when you’re in Bali, especially if you’re a big enthusiast of culture and traditional art performance. Spectacular photos! I love traditional culture and Indonesia is such a diverse and interesting mix. This last time, I got certified to free dive and left everything (didn’t even bring water) to live with the last sea gypsies to see how they have adapted to an aquatic lifestyle. More difficult to pull off than I imagined. You’ve certainly been to more islands than I have. So it’s good to see more perspectives on places I have yet to visit in the country. I can imagine how hard it must have been living with the sea gypsies. They’ve been living such way of life for generations. But we, outsiders, must make so many adjustments to live with them. However I’m sure the experience was so worth every single effort.